SOUTH BURLINGTON — A former male nurse at the Chittenden Regional Correctional Facility is facing a criminal charge of sexual exploitation of an inmate, Vermont State Police said. 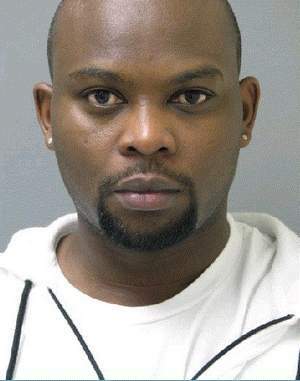 Thomas Njuguna, 36, of Colchester engaged in inappropriate behavior with a female inmate while Njuguna was acting in a medical profession, state police said. The contact with the female inmate was unwanted and unwarranted, Detective Lance Burnham said. An investigation began in February into an alleged sexual assault complaint for an incident at the jail in November 2011. The complaint indicated that a female inmate had been inappropriately touched by a male nurse at the facility, police said. Njuguna was arrested Tuesday and released on a citation ordering him to appear May 8, in Vermont Superior Court, police said. 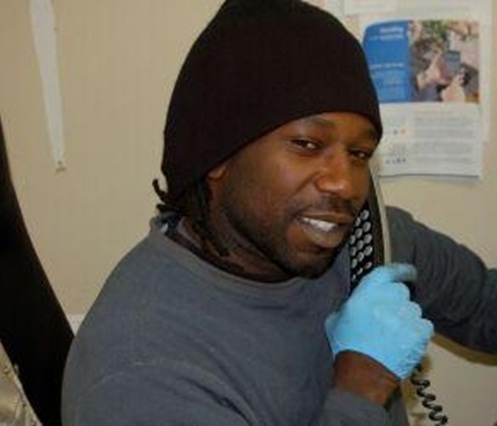 Njuguna is no longer employed by the Vermont Department of Corrections, Burnham said. He said Njuguna resigned late last year on unrelated matters. State police declined to release any information about the victim, including her age or hometown. Every night, something unusual happens in Samuel Kimani’s home on the outskirts of Nairobi, Kenya. Samuel, 48, lives with his wife Mary and their three children. Their family supports itself day-to-day through their main source of income, their cow Baraka, whose milk is collected daily and sold directly to customers for about $1.80 a day. Their township has few amenities and grid electricity is available only to the few who can afford it. But at Samuel’s house, two bright lights shine all through the evening. Samuel used to light his home with a single kerosene lamp, which filled the rooms with smoke and poor-quality light and cost $3 a week. With his low income, Samuel could support his family, but he wasn’t able to make long-term investments in other systems to light his home. That is, until he became the first person in the world to use the IndiGo pay-as-you-go solar energy system. Samuel purchased the system for an affordable $10 and now activates it automatically with a $1 scratch-card each week. Through IndiGo, Samuel’s small home now has two bright lights providing eight hours of light each evening, which enables the kids to study in the living room whilst Mary prepares food in the kitchen. Instead of spending $0.20 to charge each of their three mobile phones at one of the many local kiosks he simply charges them at home, saving $1.5 per week in the process. In today’s special edition of “Digital Diversity”, Olivia O’Sullivan, our Media and Research Assistant, interviews Simon Bransfield-Garth, the CEO of Eight19, the company providing pay-as-you-go solar energy to people like Samuel. Eight19 takes its name from the time it takes sunlight to reach the earth – eight minutes and nineteen seconds. Digital Diversity is a series of articles from kiwanja.net about how mobile phones and other appropriate technologies are being used throughout the world to improve, enrich, and empower billions of lives. Hi Simon. Can you tell us exactly what Eight19 does? What we’re trying to do is find novel ways to bring solar power to emerging markets, trying to get over some of the problems that have occurred in the last ten years when people have tried to take solar into those markets. What we did was to combine mobile phone technology and solar technology. This allows us to create what we call “pay-as-you-go solar.” So just in the same way as you buy a scratch-card for your mobile phone every so often, you buy a scratch-card which enables your solar power to work for a period of time – for example a week or month, whatever it may be. How does the system work in developing countries? How does solar power change people’s lives? The solar-as-a-service model plays very well in emerging countries partly because the pay as you go model is well understood; people have pay as you go mobile phones. But also because we’ve eliminated the upfront cost of buying a solar light, so we can give people an economic return on a day by day basis. Where people don’t have electric light their options are kerosene or in some cases candles – about 80% of Zambia uses candles – and in South Sudan, for instance some people even just use grass as a way of lighting their houses. The amount of money people spend on kerosene for lighting is huge – about 38 billion dollars. When you compare the cost of that kerosene light for light with mains electric lighting, the light out of a typical kerosene lamp costs between a hundred and a thousand times as much – just because it’s a very inefficient lamp and kerosene’s expensive. So you end up with a situation where the people who have the least income in the world are paying not just a bit more for their energy but vastly more for their energy. By providing solar we can eliminate that cost and replace it with something more modern and up to date. For example, in Kenya people are spending the equivalent of about 12 dollars a month for kerosene and for charging their mobile phone. We’re providing the IndiGo solar energy system for just over a dollar a week, so effectively for five dollars a month the user is getting light for two rooms and also power to charge a mobile. So we’ve roughly halved people’s energy spend and we’ve given them the benefit of solar power instead of kerosene. What we find is that once people have solar power then it has a very dramatic effect on their daily lives. The light doesn’t just allow them to cook but it allows things like children to do their homework. Over time users can upgrade the system to progressively more powerful solar units. As you provide more power, you enable other things – such as access to a radio or a television – and so what the electricity is doing is providing key things that we’ve come to value in the more developed world like access to information and access to media; both of which have an important social impact, including the ability to participate in the political process. It’s much more than just providing light. The fact that the weekly fee actually reduces users’ spend, by eliminating the cost of kerosene and charging phones, makes it much easier for us to sell into the market because we sell from the point of view of an economic proposition rather than just ‘solar-power is good’ – if you speak to someone who’s been living with kerosene for fifty years, sometimes it’s quite difficult to persuade them kerosene fumes are harmful things they don’t want to have. But if you say to someone who spends a quarter of their income on energy that they can halve their energy bill, then all of a sudden that has a direct impact – then after that they see the benefits of solar. Approaching this as an economic proposition seems quite important to this project – it’s not charity – do you think this is the best way to approach alternative energy and development? There’s been a shift in mindset in the last ten years or so on how to support people who are at the lower end of the income scale. There was a tendency years ago to dive in with the grand gesture –provide a tractor in Africa and so on – and the problem with that is it comes out of context, it doesn’t come with all the infrastructure that’s needed to support it and we saw many examples where the equipment breaks down and that’s the end of it because there isn’t anybody to maintain it and no spare parts. We have a firm belief that sustainable technology needs to have a sustainable business model – so as far as possible what we try to do is to build a local economy around the technology. Where we’re rolling out lights, we have local maintenance, local distribution, local marketing, and so on. A really simple example of that is we now manufacture our scratch-cards in Kenya as opposed to shipping them in because we’ve got a market for them in Kenya and we have found a local printer. So why has it been so difficult to sell solar power? The question we asked ourselves was, “if solar power is so obviously beneficial, how come the world isn’t awash with it?” One of the problems with solar and characteristic of a problem with renewables in general is the need for the end user to buy the equipment up front. Normally, to use electricity I don’t expect to have to buy my own small power station – but with renewables that’s exactly what we expect. So there is a challenge. Fundamentally, people are being asked to change their business model. Instead of using something as you go along, now they’ve got to find their own capital. In Africa if someone wants a reasonable home lighting system, the cost starts at about fifty dollars – in terms of proportion of salary, that’s roughly the equivalent of buying a car in the West. The IndiGo system addresses that by providing solar as a service with a very small initial cost. This is readily understood – people just seem to intrinsically get what we’re trying to do. One of the things that’s attractive about this approach is that once somebody transitions to solar you can be pretty certain that they’re never going back to kerosene. Solar gives a completely different class of light, it eliminates the fumes – kerosene fumes are believed to be responsible for the deaths of about 1.6 million people a year, which is more than the number of people that die from malaria, from a combination of chronic respiratory illnesses and from fire. On top of that, the carbon footprint of the kerosene is about 190 million tonnes, which in context is about the same as the carbon footprint of Argentina, or about 30 million cars on European roads. You said people, once they get their lamps they start to think about getting radios and TVs and the like – how does that work? How is it affordable? Off-grid rural customers in emerging markets have the same aspirations as everybody else. They’d like to have TV, radio, internet and a computer, fridges – all the other things that everybody else would like to have. We wanted to create a kind of a journey to help people extend their use of electricity, so we came up with this idea of the “energy escalator.” If you imagine a rural family in, say, Malawi – we provide a couple of lights and the ability to charge a phone. Over time the customer uses that and saves money at the same time. So after a period of time, their solar unit has been paid off. Then we offer an upgrade to that system. We can afford to charge a little bit more because the customer has just saved 100 dollars or so over the previous 18 months compared with what they would have spent on energy. So now that customer, say, has four lights and a radio. And then that pays off after a period of time, so you go onto the next step, maybe powering a television. And so, over a period of time a rural customer transitions in steps from no electricity to still being a rural farmer, but now having many of the benefits of electricity. We have found that people view electricity very differently to the way that we do in the developed world. In the West, we’ve been brought up with the idea that electricity is relatively cheap so we use it in pretty inefficient ways – a great example is if I want to make a cup of coffee in the morning, then somebody over in a power station takes some fossil fuel which they burn to heat water, to drive a turbine, to generate electricity, to go a long way down a cable to warm up water to make my cup of coffee. There are great chunks of that chain which are inefficient. Whereas for off-grid customers, nobody would dream of using electricity to boil water, electricity’s far too valuable to use for that; you use electricity because it gives you information, it gives you communication, it gives you light – it’s a very valuable commodity. Do you think that if this does scale up widely, we’ll ultimately have an off-grid, more efficient energy system in the developing world than the one that exists here? And in a sense these countries will just skip the grid? I think that’s exactly what will happen. When we look at the off-grid market, the numbers are actually very substantial – there’s somewhere between 1.4 and 1.6 billion people, around 22 % of the world’s population without electricity. One of the assumptions prevalent about ten years ago was that the grid would eventually reach everyone. But the cost of extending the grid to rural areas is very high and today power can be delivered more cost-effectively using renewables, generated locally. This is directly analogous to mobile phones which have removed the need to extend landlines into rural areas. IndiGo enables the end user to fund the infrastructure, using the premium they were previously paying for kerosene, in order to get their own power generation without the up-front cost. How do you plan to expand and scale up and how do you think energy use is going to expand in the developing world in the future? At the moment have products in Kenya, Zambia, Malawi and South Sudan. And our vision is that these products will grow with the dynamics of consumer electronics, rather than the dynamics of alternative energies. It seems just to be something that works. And people really like it. When we did our first trial of 30 units in South Sudan, a queue formed of people standing there with their ten dollars saying ‘I want my light please’ and we had to say ‘sorry, we’ve only brought 30 this time’ and they were quite upset because they wanted their light! It’s just about providing a mix of technology and business model that enables things to move forward. If you think of the rate at which mobile phones for instance penetrated developing markets, that’s the sort of dynamic that we would like to get. So our goal is to have tens of thousands of customers this year, hundreds of thousands of customers next year and millions of customers the year after. It is, but there are three hundred million households which don’t have access to electricity so unless you get into the millions you’re not making a dent in the problem. One of the things that we see is the transformational change that you get when people have access to this power, it’s not just a case of saving money but it enables people to do things that they previously couldn’t, because they have access to information, to media and to light. So a really simple example of one of the things that people do with mobile phones – people can move from just growing subsistence crops to having market information, market prices so they can grow more in the way of cash crops, and get involved in much more energetic economic activity. In a sense it’s a way of helping people get into the information age without having to go through the industrial revolution. Simon Bransfield-Garth has 25 years global experience building rapid growth, technology-based businesses in sectors including semiconductor, automotive and mobile phones. His career includes 7 years at Symbian, the phone OS maker, where he was a member of the Leadership Team and VP Global Marketing. Simon was founder of Myriad Solutions Ltd and was previously a Fellow at Cambridge University. He holds a BA and Ph.D in Engineering from St John’s College, Cambridge UK. Digital Diversity is produced by Ken Banks, innovator, anthropologist, National Geographic Emerging Explorer and Founder of kiwanja.net / FrontlineSMS. He shares exciting stories in “Digital Diversity” about how mobile phones and appropriate technologies are being used throughout the world to improve, enrich, and empower billions of lives. You can read all the posts in this series, visit his website, or follow him on Twitter. Written and directed by Ekwa Msangi-Omari (Weakness), the 12-minute film Taharuki (“Suspense”) traveled through the festival circuit last year and is now available on Amazon. Taharuki is produced by screenwriter and S&A reader/contrubutor Kia Barbee (Elmhurst Entertainment), Inna Braude, Njeri Micheu & Monika Greenleaf. Taharuki/Suspense, which stars Miriam Chemmoss, Gilbert Owuor and Chris Kamau, is a fictional story set in the aftermath of the Kenyan 2007/2008 election violence, as a couple from different tripes working for an underground liberation movement attempt to expose a child-trafficking cartel. Watch the trailer below. You can order the film via Amazon HERE. 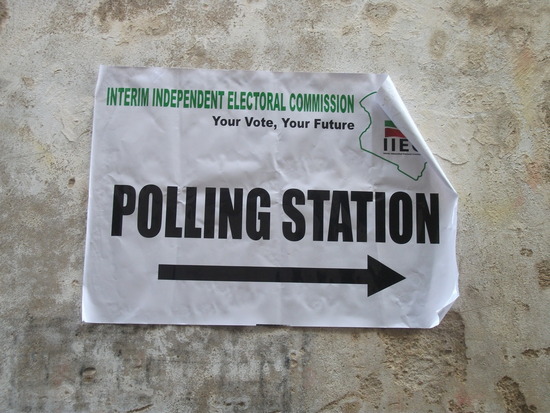 The Independent Electoral and Boundaries Commission (IEBC) will establish polling stations in all regions in North America and Europe that have significant number of Kenyans to facilitate voting in the next general elections. In a move to allay fears among Kenyans living abroad who have recently received mixed signals from Nairobi concerning their rights to vote in the next elections, the government last week dispatched Foreign Affairs Assistant Minister Richard Onyonka to the US with a message that the government intends to respect their right to vote. “Kenyans living abroad will vote in the presidential elections. Polling will not be confined to the embassies and high commissions. Ambassadors and High Commissioners will not be returning officers because we know they are political appointees,” said Onyonka. Addressing participants during the Diaspora Summit held on Saturday in Boston, Onyonka dispelled rumours that Kenyans abroad will have to travel to the High Commissions and Embassies to cast their votes. Onyonka said North America will be balkanized into at least seven regions where voting will take place. This will include; New England area where Boston falls, New York-New Jersey area, the Tri- State area which is Pennsylvania-Delaware-Southern Jersey, DMV area which falls under DC-Maryland-Virginia, the Carolinas-North and South Carolina and Atlanta, Georgia-Alabama-Mississippi-Louisiana areas. Others will be Illinois,Missouri Kansas, Oklahoma areas, Iowa-Wisconsin-Michigan-Minnesota areas. Other polling stations will be in the Texas areas- Dallas-Houston, California, Seattle Washington. In Canada, polling stations will be in Toronto, Ontario and Ottawa. This will be in addition to the consulate stations. Speaking to the Standard in Boston, Onyonka clarified that these were still tentative polling places as the Ministry of Foreign Affairs and IEBC were still analysing population trends and migration patterns of Kenyans before they make final determination. “In this regard, we urge the Diaspora to register with our embassies and high commissions for us to have a sense of how many they were and in which part of the country of their sojourn they are settled,” he said. He said that based on the recent pilot voting done in some areas in Mombasa, it was determined that the Diaspora will only vote for President and not at all levels as the Diaspora has demanded. Onyonka who was accompanied on the US trip by IEBCfs vice chairperson Dr. Elizabeth Muli said IEBC will recruit and train some Kenyans in Diaspora to act as Returning Officers. He said the ambassadors and high commissions will be confined to administrative duties and will have nothing to do with polls because they are perceived as not being neutral. He said the government was also exploring the possibility of enlisting the services of credible poll bodies in the US and Canada to act as returning officers and observers. “Itfs very important for the government to make sure that the polls are not just free, fair and peaceful but that they are also seen to be so,” he added. Secret files from British colonial rule – once thought lost – have been released by the government, one year after they came to light in a High Court challenge to disclose them. Some of the papers cover controversial episodes: the Mau Mau uprising in Kenya, the evacuation of the Chagos Islands, and the Malayan Emergency. They also reveal efforts to destroy and reclassify sensitive files. The Foreign Office says it is now releasing “every paper” it can. But academics say the Foreign Office’s “failure” to deliver the archive for decades has created a “legacy of suspicion”. 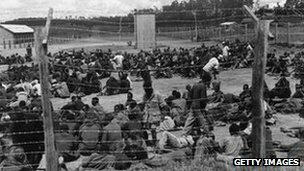 In January 2011 – following a High Court case brought by four Kenyans involved in the Mau Mau rebellion – the government was forced to admit that 8,800 files had been secretly sent to Britain from colonies, prior to their independence. It said the files had been held “irregularly”. Professor David Anderson, an adviser to the Kenyans in the case and professor of African History at Oxford University, said progress had been made retrieving “the ‘lost’ British Empire archive”, but added there was still a “lurking culture of secrecy” within government. He added that the release of the files would help “clear the air on Britain’s imperial past”. The 1,200 records being released are the first of six tranches to be made public at the National Archives by November 2013. They cover the period between the 1930s and 1970s and were physically transferred or “migrated” to the UK. The archive contains official documents from the former territories of Aden, Anguilla, Bahamas, Basutoland (Lesotho), Bechuanaland (Botswana), British Indian Ocean Territories, Brunei, Cyprus, Kenya, Malaya, Sarawak and the Seychelles. The archive released on Wednesday details how British colonial officials selected files for secret “migration” back to Britain – using criteria set out in a 1961 memo by the Secretary of State for the Colonies, Iain Macleod. They were instructed to keep papers that might embarrass the UK government, other governments, the police, military forces or public servants; might compromise sources of intelligence; or might be used unethically by ministers of successive governments. 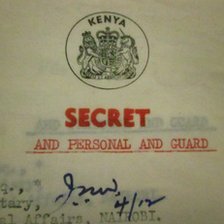 According to Kenyan ministry of defence files from 1961, administrators devised new classifications, such as “Watch”, in order to withhold information from indigenous governments. Files stamped with a “W” could only be viewed by a “British subject of European descent”, while “legacy” files could be passed on to subsequent administrations. Other new classifications included Personal, Delicate Source, and Guard – which could “not be communicated to the Americans”. The Kenyan files also contain references to material being destroyed. Colonial files from the Malayan administration also point to the destruction of papers – ahead of the country’s independence in 1957. In July 1956, an official writing to the private secretary to the British high commissioner questions what to do with archives relating to the Malayan Emergency – the 1948-1960 conflict with communist insurgents. Referencing the “List C” papers, he writes: “I have been through them and it would seem that some contain items of historical interest in the event of anyone writing a history of the Emergency or biography of former high commissioners. An appendix in the same file indicates that “List C” documents are to be “destroyed”. Researchers who have studied the colonial archive say there is little reference to the alleged massacre of 24 unarmed rubber plantation workers by British troops at Batang Kali in December 1948 – during the Malayan Emergency. Tony Badger, professor of history at Cambridge University – who has been appointed by the Foreign and Commonwealth Office (FCO) to review the files – said the government was releasing “every paper” it could, rather than merely “every paper of interest”. However, he added the release was “long overdue”. “Given the failure of the Foreign Office to acknowledge the existence of – and certainly the failure to manage the migrated archive until very recently, you can amply understand the legacy of suspicion amongst journalists and academics about these records”, he said. He estimated that “well under 1% of material” had so far been held back from release. A Foreign Office spokesperson said the foreign secretary was “pleased” with the release and “committed” to making the colonial archive “available to the general public as soon as possible”. Two hours, 31 minutes, and 51 seconds after the Boston marathon began on Monday, its male and female champions had already finished. A few minutes later, race-watchers noticed something. The first, second, and third-place men were all Kenyan. So were the first, second, and third-place women. It was yet another amazing showing for Kenyan runners, and yet another reason to ask: how? For such a popular, straightforward question, there’s less consensus than you might think. Western research on the nature of Kenyan runners, and on successful African athletes in general, is complicated by some particularly thorny racial politics. There’s a nasty history, after all, to white scientists evaluating the physical attributes of Africans. But that hesitancy to really study Kenyan runners’ success has allowed some probably false, and often culturally reductive, theories to persist. The scientific research hits on some of the most sensitive racial anxieties of Western-African relations, but it’s also an amazing story of human biodiversity. The statistics are hard to ignore. This medium-size country of 41 million dominates the world in competitive running. Pick any long-distance race. You’ll often find that up to about 70 or 80 percent of its winners since the late 1980s, when East African nutrition and technology started catching up with the West, have been from Kenya. Since 1988, for example, 20 of the 25 first-place men in the Boston Marathon have been Kenyan. Kenyan women appear to have had a later start, winning none of marathons before 2000 (possibly due to discriminatory laws and a tradition of forcing girls into marriages, both of which were partially rolled back by 1990s reforms) and 9 of 13 since then. Of the top 25 male record holders for the 3000-meter steeplechase, 18 are Kenyan. Seven of the last 8 London marathons were won by Kenyans, and the sole outlier was from neighboring Ethiopia*. Their record in the Olympic men’s marathon is more uneven, having placed in the top three in only four of the last six races. Still, not bad for one country. And even more amazing is that three-fourths of the Kenyan champions come from an ethnic minority of 4.4. million, or 0.06% of global population. It turns out that Kenyans’ success may be innate. Two separate, European-led studies in a small region in western Kenya, which produces most of the race-winners, found that young men there could, with only a few months training, reliably outperform some of the West’s best professional runners. In other words, they appeared to have a physical advantage that is common to their community, making it probably genetic. The studies found significant differences in body mass index and bone structure between the Western pros and the Kenyan amateurs who had bested them. The studied Kenyans had less mass for their height, longer legs, shorter torsos, and more slender limbs. One of the researchers described the Kenyan physical differences as “bird-like,” noting that these traits would make them more efficient runners, especially over long distances. Racial politics can make the genetics of African athleticism difficult to talk about in the West. Surprisingly, Western popular writing about Kenyans’ running success seems to focus less on these genetic distinctions and more on cultural differences. For years, the cultural argument has been that Kenyans become great runners because they often run several miles to and from school every day. But, about a decade ago, someone started asking actual Kenyans if this was true, and it turned out to be a merely a product of Western imaginations: 14 of 20 surveyed Kenyan race-winners said they’d walked or ridden the bus to school, like normal children do. Another cultural argument says they run barefoot, which develops good habits, but if this were true then surely the far more populated countries of South Asia, where living without shoes is also common, would dominate over Kenyans. Another ascribes it to the “simple food” of Kenya, but this again is true of many parts of the world, and Kenya’s not-so-great health record suggests the country has not discovered the secret to great nutrition. And there is a cringe-inducing theory, still prevalent, that Kenyans’ history as herders means they get practice running as they chase their sheep across the countryside. Another argument notes that many of Kenya’s best runners come from the sunny highlands in the Great Rift Valley, which also happens to be the birthplace of homo sapiens. The land there is flat with mild year-round weather, encouraging regular outdoor running. The high elevation — about 7,000 feet — could help runners here develop lungs capable of functioning in thinner air. When these runners descend to the relatively low-elevation courses at Boston or Beijing, the thicker atmosphere there would give them, in effect, a sustained oxygen boost. This may help explain why they developed physical traits better suited for running, although it’s possible that these features are also due to something called “genetic drift” — evolution is based on random genetic mutations, after all, so any isolated community will “drift” to certain common traits for no reason other than chance. Still, there are plenty of high places in the world, and neither Swiss nor Nepalese runners have yet made their big debut. And the conventional wisdom among trainers is that, although high altitudes can help develop lung capacity, the best way to do this is by sleeping at high elevation and training at low elevation. These theories seem to say more about how the West sees Kenya than about Kenya itself. But they are deep in the Western understanding. Malcolm Gladwell’s ultra-best-seller, Outliers, shows just how deeply ingrained this thinking has become. His chapter on Kenyan runners argues, as one blogger summarized it, “ideal environments + a tremendous amount of hard work and focus on a specific thing = success beyond what most people achieve.” World-champions runners, Gladwell says, are idolized in Kenya the way that Americans idolize rock stars. Talking about the greatness of African athletes can be fraught in the Western world. Generations of American slavery were justified in part by arguments that Africans were “specialized” for physical labor, and whites for mental work, ideas that have persisted in American paternalism and racism through today. For a white writer like myself (or a white researcher or a white anthropologist) to talk about the physical attributes of black men and women can echo some of the worst moments in modern history. And there is something distasteful about reducing Africans to the prowess of their best athletes. After all, Kenya’s contributions to the world include, for example, great writers, environmentalists, and politicians. It’s hard to talk about the subject without revealing some bias, or giving the impression of trying to explain away their success, or hitting on some still-fresh cultural wound from centuries of exploitation. This may be why definitive answers seem so hard to find, and why we tend to embrace theories that downplay legitimate biological distinctions and emphasize the idea that Kenyans simply work harder. But this kind of thinking, though clearly well intentioned, is a kind of condescension in itself. We’re so afraid of reducing Africans to their physical attributes that we’ve ended up reducing them to an outdated stereotype: Cool Runnings, the barefoot village boy who overcame. Scientific research on the success of Kenyan runners has yet to discover a Cool Runnings gene that makes Kenyans biologically predisposed to reaching for the stars, or any scientific basis for Gladwell’s argument that they just care more. Most of Kenya’s Olympic medal winners come from a single tribe, the Kalenjin, of whom there are only 4.4 million. Sub-Saharan Africans have identified themselves by tribes such as this one for far longer than they’ve identified by nationality — a system mostly imposed by the Western colonialism — so the Kalenjin distinction is not just academic, and the tribe is probably genetically insular enough that common physical traits could inform their athletic success. In 1990, the Copenhagen Muscle Research Center compared post-pubescent schoolboys there to Sweden’s famed national track team (before Kenya and a few other African countries began dominating international racing events in the late 1980s, Scandinavians were the most reliable winners). The study found that boys on the high school track team in Iten, Kenya, consistently outperformed the professional Swedish runners. The researchers estimated that the average Kalenjin could outrun 90% of the global population, and that at least 500 amateur high school students in Iten alone could defeat Sweden’s greatest professional runner at the 2,000-meter. A 2000 Danish Sports Science Institute investigation reproduced the earlier study, giving a large group of Kalenjin boys three months of training and then comparing them to Thomas Nolan, a Danish track superstar. When the Kalenjin boys trounced him, the researchers — who had also conducted a number of physical tests and compared them against established human averages — concluded that Kalenjins must have an inborn, physical, genetic advantage. They observed a higher number of red blood cells (which lent new credence to the theory that elevation makes their bodies more effective oxygen-users) but, in their conclusions, emphasized the “bird-like legs” that make running less energy-intensive and give their stride exceptional efficiency. Unlike the 1990 research, which came only a few short years into the Kenyan phenomenon, the 2000 study landed in the middle of an international debate about why these young men and women from East Africa were dominating a sport that had long been a point of Western pride. It was controversial. “There’s nothing in this world unless you work hard to reach where you are, and so I think running is mental,” said Kenyan Olympic gold medal-winner Kip Keino, who condemned the research as racist. Westerners wrote about the “black speed genes,” and some wondered if Kenyans had an unfair advantage. Running, like any sport, is inherently physical, and physical traits inform athletic success. Just because Larry Bird and Michael Jordan are tall doesn’t mean they aren’t first and foremost great athletes. Part of Olympian Michael Phelps’ record-breaking swimming is his unusual body shape, which is genetically inborn; you can’t train for longer arms. All athletes owe some of their success to their own physical traits, but because Kalenjin runners share those traits across an ethnic group, and because that ethnic group is part of the story of colonialism and white exploitation of blacks for their physical labor, it’s harder to talk about. But that doesn’t make their athleticism any less amazing. The name of Barack Obama, the father of the American president, is on the top of a list of names revealed in a hitherto secret British colonial file of Kenyans studying in the US. The file notes that the US state department had told British officials in 1959 that they were concerned Kenyan students in America had a reputation for “falling into the wrong hands”. US officials complained that Kenyan students were becoming “anti-American and anti-white” just at the time Barack Obama Senior was given a grant to study in America. British colonial administrators in Nairobi expressed concern about the calibre of Kenyans receiving scholarships to go to US universities, claiming they were “academically inferior” to their contemporaries who stayed in Africa to study. They criticised a US-based body, the African American Students Foundation, which gave Obama Senior grants to study business administration at the University of Hawaii, Honululu. Supporters of the project included the singer Harry Belafonte, the actor Sidney Poitier, and the baseball player Jackie Robinson. 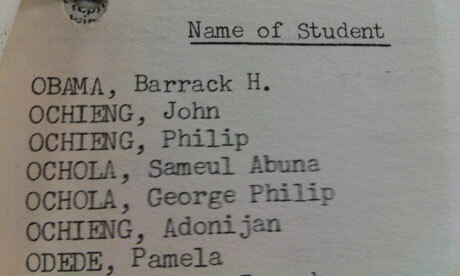 The president’s father is listed as “OBAMA, Barrack H” in the file of Kenyan students in the US drawn up by British colonial officials. A year later, in 1960, Obama Senior met a white American called Ann Dunham on a Russian language course at the university. They married the next year and had a son, elected the first black US president in 2008. Obama Senior died in car crash in Nairobi in 1982. His father, the president’s grandfather, Onyango, was jailed by the British for six months in 1949 for his involvement in the Kenyan independence movement. Obama Senior’s stepmother, Sarah Onyango Obama, has said he was subjected to beatings and abuse which caused permanent physical disabilities, and a hatred of the British. The Late Nick Njenga: December, 17th, 1981 – April, 13th, 2012. We regret to announce the sad demise of Nick Njenga. The 31 year old Nicholas Njenga of Savanna Auto Care in Newark, Delaware was working on the company truck. Nicholas was pinned between the gate and the truck after the lift gate malfunctioned. He died of his injuries at Christiana Hospital in Newark, Delaware on April 13, 2012. Nicholas was the son of Mr. Joe Njenga Mungai and Mrs. Hannah Nyambura Njenga of Kiserian, Ngong Kenya. He was the brother to Anthony Mungai Njenga, Fredrick Kiarie Njenga of Kiserian Ngong, Caroline Njoki Njenga, and Benson Njuguna Njenga of Middletown Delaware USA. Family and friends are meeting daily at Christ Celebration Center, 104 Carson Dr., Newark, DE 19701 from 6pm. There will be a Memorial Service on Saturday April 21, 2012 at New Life Worship Center located at 60 Fir Ave., Bear, DE 19701. Viewing starts at 3 pm and the Service at 4pm followed by a fundraiser.